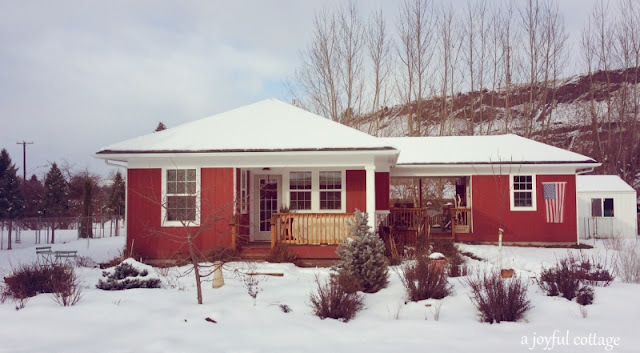 Welcome to our 2016 Christmas cottage. In keeping with our simple lifestyle, I've taken a minimal approach to decorating at A Joyful Cottage this year. 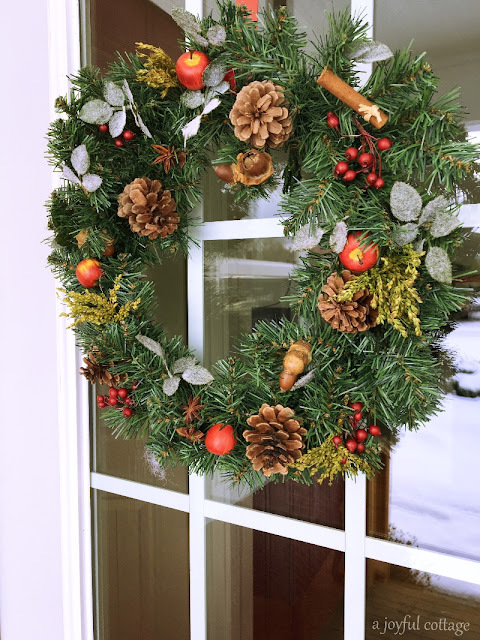 A nature-inspired wreath hangs on our door. Potted rosemary is dressed in plaid and accessorized with a burlap "Merry Christmas" star. If we happen to brush the rosemary as we enter the cottage we receive a pleasant scent as a reward. 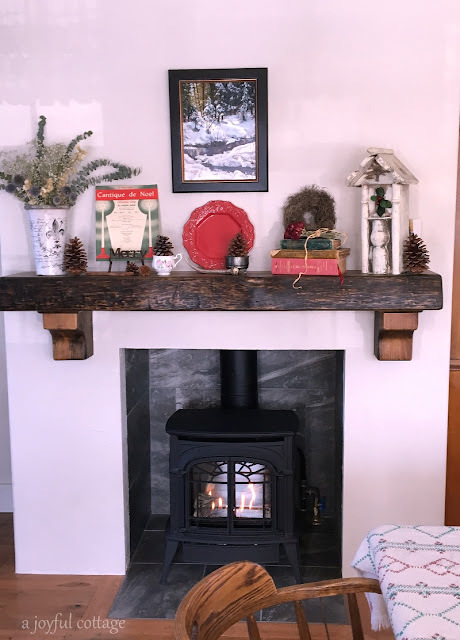 The fireplace is the focal point of our cottage, so it's where I expend the most Christmas decorating energy. You'll find the whole story of my mantel transformation from its every day look to Christmas splendor at Wayfair, and have a chance to see the pretty Christmas mantels of seven other bloggers. 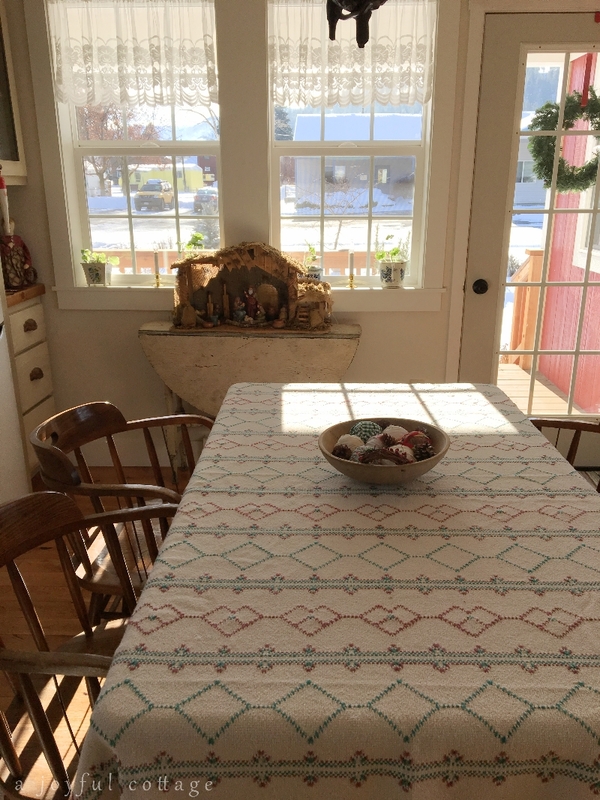 A tablecloth done in Swedish weaving covers the dining table. (You can read more about the tablecloth in last year's Christmas post here.) It's one of our favorite possessions. 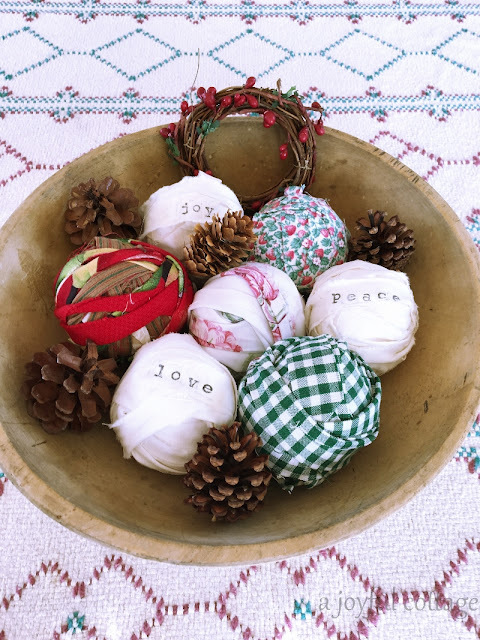 In line with the Scandinavian simplicity, the centerpiece is a humble wooden bowl filled with rag balls, pine cones and a tiny wreath. I've had this nativity for almost twenty years. It wouldn't be Christmas without it. 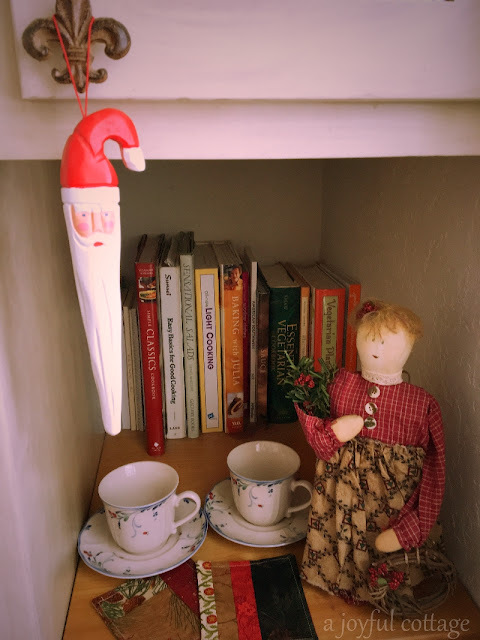 The little cubby where I keep cookbooks receives some attention, too. I like to make small seasonal changes on my stove hood shelf. 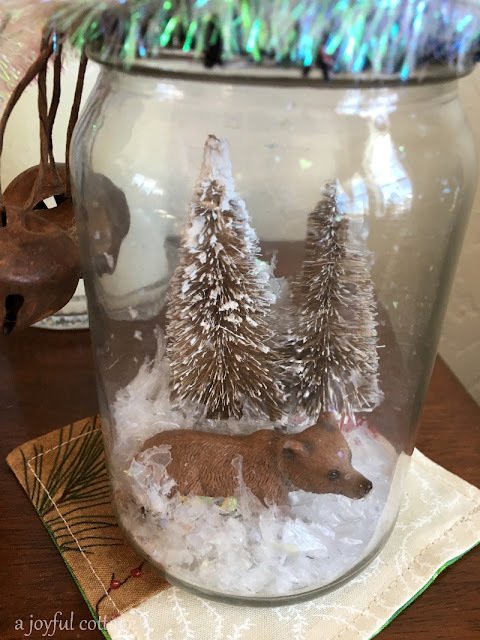 The snow globe I received last year from AnnMarie of Musings of a Vintage Junkie reminds me that I've made wonderful friends through blogging. One of the collages I made hangs on my studio door. Finally, the teeniest of tiny Christmas trees. . .nestled next to the plants in my garden window. This is Christmas 2016 at A Joyful Cottage. Uncomplicated and relaxed. Life is good. God's in His heaven -- all's right with the world. May you enjoy a peaceful and hope-filled season. Sharing with Home for Christmas. What a cozy dining room! Love the tablecloth. 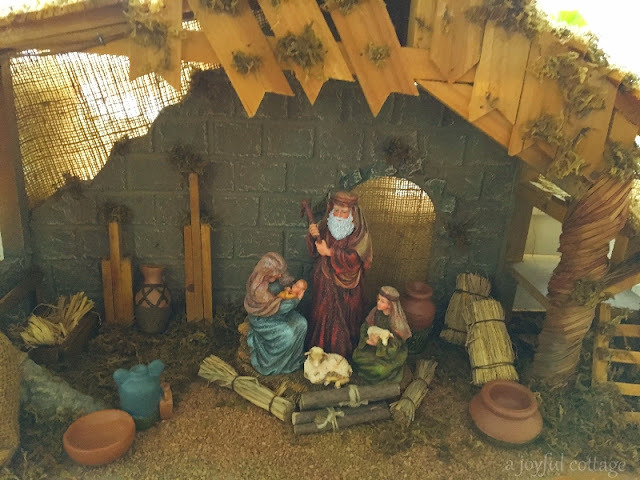 Visiting from Home for Christmas linkup. Such calming beauty here. Very nice. You've created a warm cozy atmosphere with your holiday treasures sprinkled throughout your cottage, Nancy. I like that everything you've displayed has a special place in your heart. Your dining room looks so pretty bathed in sunlight, and your shelf on your stove hood is so pretty! 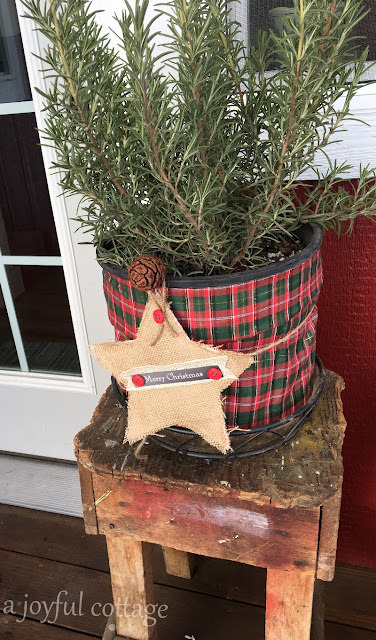 Thank you so much for sharing your Christmas home tour with us! and so you . . . Being true to self holds the star . . . Happy, Merry, Blessed Christmas . . . Visual treats. I so enjoyed visited your Christmas decorated home. Hugs. 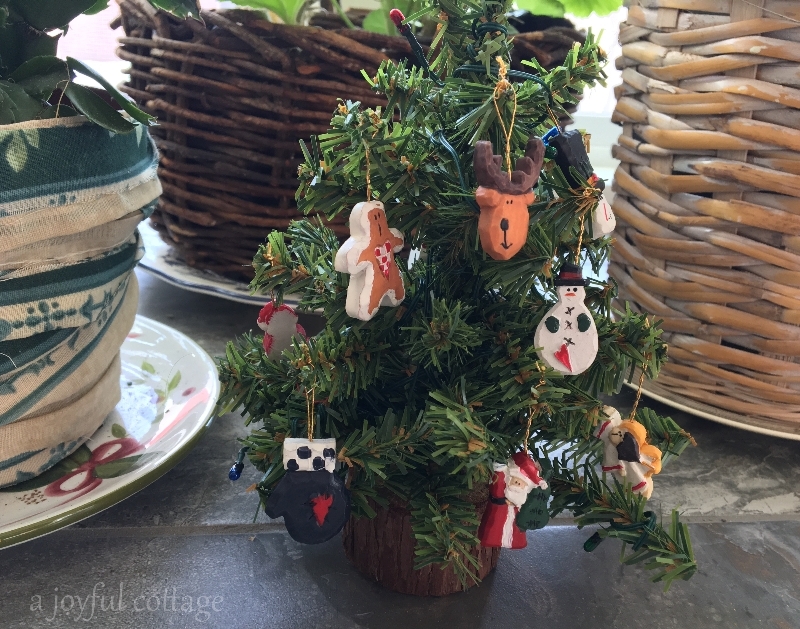 I love your simple homespun treasures, Nancy! They truly compliment your beautiful home snd everything looks perfectly festive! Nancy, I so enjoyed the understated, simple beauty of your decorations, your home looks fresh and festive. But that tablecloth! That is magic! your Christmas is filled with such a lovely and cozy atmosphere, thank you for sharing the joy your home gives to everyone you welcome ! Dear Nancy ~ Your cottage looks sweetly decorated. I also did a lot less decorating this year. It feels good. Your cottage is filled to the brim with charm and love. Trust you and your family have a blessed Christmas season. Just my style, simple and homey. My favorite is the tiny tree in the window. Sweet blessings my friend. You are such an inspiration! I also have gone minimalist this year with my Christmas decor. No tree, just some pine cones and berries and a wreath similar to yours on my front door. Christmas blessings to you and yours this holiday season. Your sweet cottage is filled with so much pretty and cozy. Love it all. Everything is delightful . . . simple and charming. Such warmth and charm. So cosy. I love the sweet simplicity. 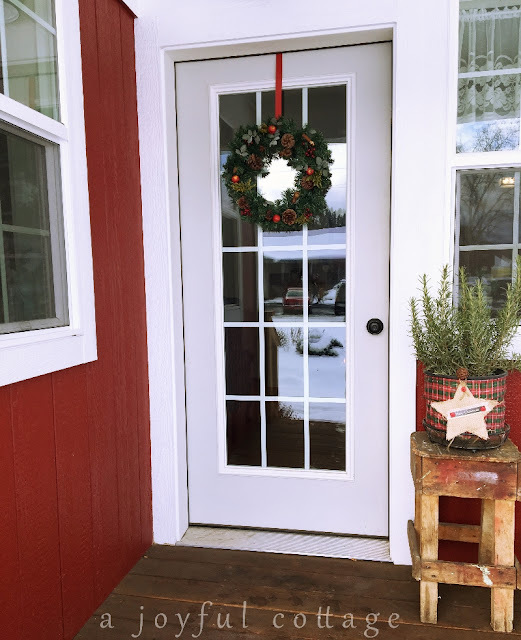 Our Christmas sprucing up in our little cottage is quite simple and homey as well. It is just the way we love it. So sweet and inviting and cozy. I absolutely love your nativity and the tablecloth is so special. I had forgotten that I sent you the bear. Thanks for showing it! Dearest Nancy, you and me both; we have come to decide that simplicity is the way to go this year AND with a natural theme. 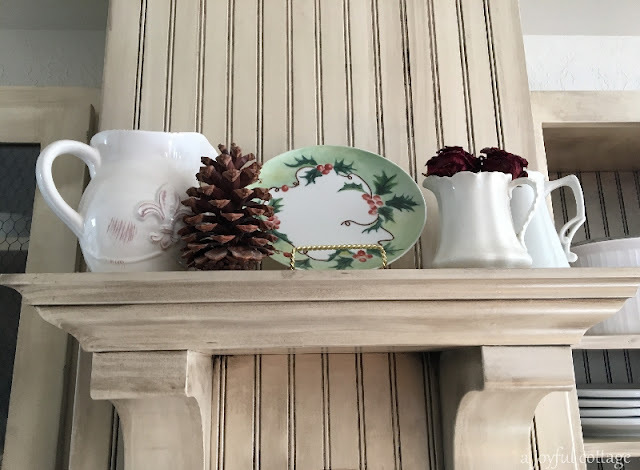 I love your Scandinavian style decor, with wood, antique table (love that little one by the window) and pine cones, wreaths, other items. I do love glitz and glitter, but this year, nature shines more brightly for me. Enjoy the light of HOPE that this season reminds us of! Hello Nancy, I hadn't realized you were back! That's good news and I enjoyed my visit to your simple and uncomplicated cottage Christmas. I love your collage, it reminds me a an old Redbook December magazine I've kept for many decades. 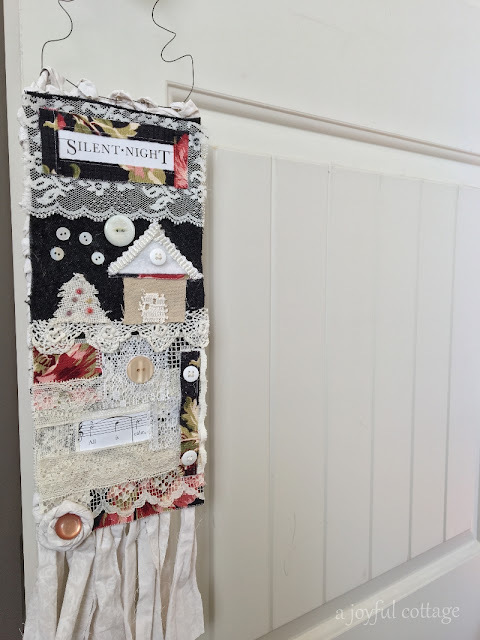 They used to feature a couple of families in it each December and one of them specialized in Christmas banners made up of bits of lace on old denim scraps. The whole spirit of your house reminded me of hers. Thanks for stopping by, Lisa and for the nice comment. Happy Holidays! I'm am sooooo LATE to the party! Welcome back to blogging. I missed you and the cottages that you show. Your cute cottage is ready for Christmas. Again, so glad you are back! Perfect!! I love the simplicity of it. I also have made my decorating more simple. I use to do up 4 trees!!! It is funny how we change, I find simple works best for me. I enjoyed your tour. You have done it perfectly well Nancy, I love the tablecloth and the wooden bowl filled with the rag balls. Everything looks great! Wishing you a lovely advent season! Wonderful! Your cottage looks so sweet inside and out. What a cozy, lovely place! Thank you for sharing! Have a wonderful, joy-filled holiday season, Nancy! Your Cottage looks perfectly cosy and very welcoming. I love your decoration, simple and pretty. Your cottage is so cheerful and inviting. Love all of your sweet holiday decorations.